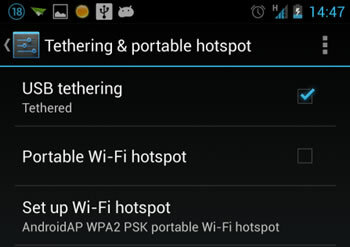 1ï¼Create a Wi-Fi hotspot on your Android device. The detailed steps may vary for different devices, but should be similar this: Go to Settings > WIRELESS & NETWORKS > MORE > Tethering & portable hotspot and check the box next to Portable Wi-Fi hotspot. You can press Set up Wi-Fi hotspot to set a password for the hotspot if you need extra security. 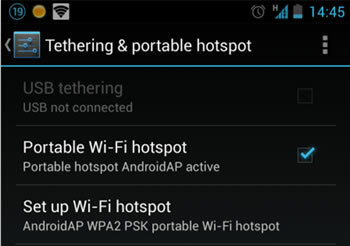 2) Connect your computer to the Android hotspot wireless network you just created. The hotspot name should be something like AndroidAP. 3) Open AirDroid on your device, go to Tools tab, and press Tethering. A new AirDroild url like âhttp://192.168.43.1:8888â will be displayed. 4) Visit the full url above on your computer web browser to start using AirDroid. 1) Connect your Android to your computer with a USB cable. 2) Enable USB tethering. The detailed steps may vary for different devices, but should be similar: Go to Settings > WIRELESS & NETWORKS > MORE > Tethering & portable hotspot and check the box next to USB tethering. 3) Open AirDroid on your device, go to Tools tab, and press Tethering. A new AirDroild url like âhttp://192.168.42.129:8888â will be displayed. trang nguyen likes this post. We've tested this and it works well on our side. Would you please tell us your device model, Android version and what web browser are you using? And should it be possible that you typed a wrong IP address?